Early reintegration to training and match play following injury increases the risk of reinjury. However, having key players available benefits the team.1 Practitioners must balance these two components of the return to sport (RTS) process, combining evidence and clinical experience to estimate this risk, then plan and adapt RTS accordingly.1 Quantifying and monitoring training load is key in guiding this process while managing reinjury risk,2–4 and global positioning systems (GPS) provide a valid measure of external running loads.5 However, as practitioners, we should focus on both quantitative aspects of running load progression and qualitative characteristics of movement in competition. This includes highly variable, spontaneous and unanticipated movements (the conditions of ‘chaos’) reflecting the unpredictable nature of the sport. In this editorial, we present the ‘control-chaos continuum’ (CCC) (figure 1), interlinking GPS variables, while progressively incorporating greater perceptual and reactive neurocognitive challenges.6 7 This framework moves from high control to high chaos, and is based on more than a decade of rehabilitation and RTS in the demanding setting of English Premier League football. 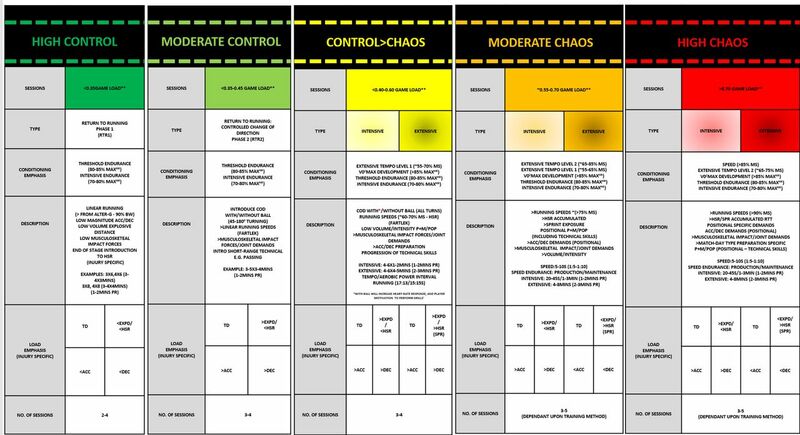 Return to sport framework - the control-chaos continuum. Control=high level of structure on behaviour/actions/movement, that is, controlled situation. Chaos=unpredictable behaviour/actions/movement, as to appear random/reactive, that is, chaotic situation. Green represents high control (low intensity) moving towards high chaos (high intensity). Model can be adjusted according to specific injury diagnosis, estimated tissue healing times and expected return to training. Acc/Dec Magnitude =rate of change in velocity, for example, 3 ms−2. **Game load adjustable dependent on injury type/severity. ACC, accelerations; BW, bodyweight; COD, change of direction; DEC, decelerations; Exp-D, explosive distance (accelerating/decelerating from 2 to 4 ms−1 <1 s); HSR, high-speed running (>5.5 ms−1); MS, maximal speed; MAXHR, maximal heart rate; PR, passive recovery; SPR, sprint distance (>7 ms−1); TD, total distance. Using retrospective player chronic running loads (GPS) in conjunction with estimated tissue healing times, we propose a five-phase framework. 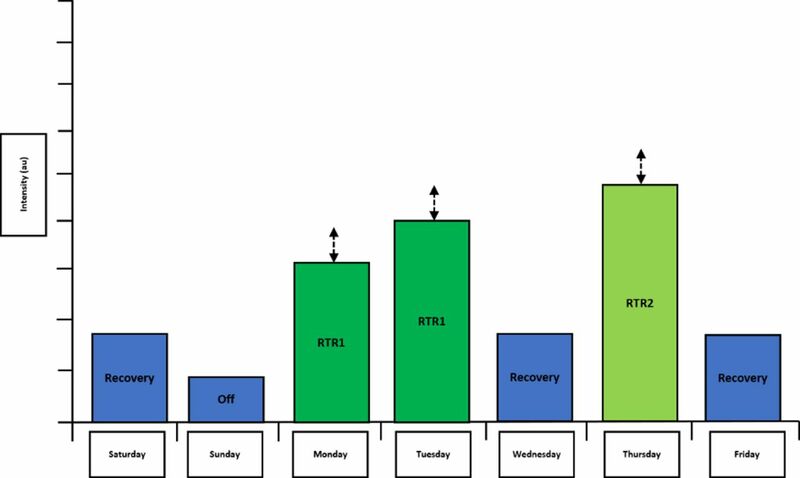 We give the example of a central defender with a hamstring injury; estimated return to training after 6 weeks of rehabilitation, with a sample chronic load progression (figure 2). However, the model applies to both short-term and long-term injuries using shorter or longer phases—particularly as progression is criteria based, not time dependent. We also share examples of strength and power diagnostics that we use to accompany GPS data to inform phase progression decisions (table 1). Sample return to chronic running loads using the control-chaos continuum. Data representative of central defender game load, that is, physical demands of game (mean) and respective training and concurrent (including game) in both absolute and relative (game load, ie, 2x=2 games). Control-chaos continuum: control=high level of structure onbehaviour/actions/movement, that is, controlled situation. Chaos=unpredictable behaviour/actions/movement, as to appear random/reactive, that is, chaotic situation. Green represents high control (low intensity) moving towards high chaos (high intensity). High-speed running, >5.5 ms−1; Sprint distance, >7 ms−1; Explosive distance (accelerating/decelerating from 2 to 4 ms−1<1 s). Aims: Return to running with high control over running speeds/loads (figures 1 and 3), low musculoskeletal impact forces, building player confidence. Example of a potential weekly planning template from high and moderate control. Arrows represent session load increments in week-to-week individual return to running sessions (increments represent increases in running loads individualised to the player and specifics of their injury). Intensity, arbitrary unit (au); Off, day off; Recovery, recovery day; RTR1, return to running 1; RTR2, return to running 2. First, determine key considerations specific to the injury (eg, speed progression for hamstring injury or passing volume for a groin injury) and the individual (eg, position or style of play) alongside potential risk factors for reinjury (table 1). The goal during an early return to running is a gradual increase in the volume of running at lower speeds, thereby limiting high-speed running (HSR) exposure (<60% maximal speed (MS)) and musculoskeletal demands (online supplementary video 1). Linear running at lower speeds also minimises high acceleration/deceleration magnitudes (figure 1). Sport-specific tasks, that is, incorporating a ball, are minimised to reduce movement variability, and manipulation of work to rest ratios enables appropriate energy system development (figure 1). Aims: Introduce change of direction (COD) with the ball, reduce control (somewhat controlled chaos) and HSR load progression (figure 2). We progressively integrate COD to gradually reduce control, with acceleration/deceleration demands determined by the intensity and volume of directional changes. The goal is to both reduce the degree of task constraint8 and to progressively increase explosive distance (distance covered accelerating/decelerating, i.e, from 2 to 4 ms−1 <1 s) relative to the player’s preinjury training demands. We increase linear HSR (60%–70% MS) and COD activities with and without the ball to increase movement variability (online supplementary video 2), the relative proportion of these activities depends on both the player and the specific injury (table 1). Aims: Introduce football specific weekly structure (figure 4) to overload game-specific demands reflecting a transition from control to chaos (inclusion of limited volume of movements with unanticipated actions). Example of a potential weekly planning template from control—>chaos to high chaos. 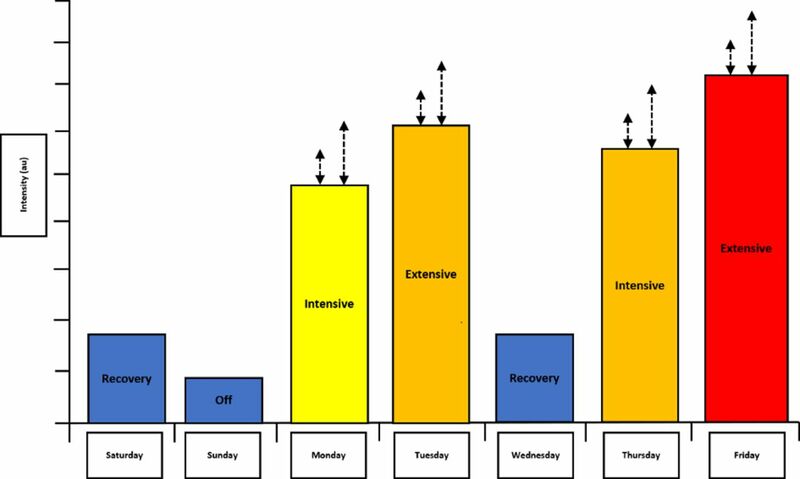 Arrows represent load increments in week-to-week individual intensive and extension outdoor physical preparation sessions to build chronic load (increments represent increases in running loads individualised to player and specifics of their injury). Extensive, extensive football; Intensive, intensive football; Intensity; Intensity, arbitrary unit (au); Off, day off; Recovery, recovery day. Extensive football reflects typical match demands, using larger areas to produce higher speed and distance.9 Drill presciption progressively incorporates running at higher speeds (>65%–80% MS) using aerobic power interval runs to target the required energy systems (online supplementary video 6). Aims: Increase HSR under moderate chaos (unpredicted movements, minimal limitations), with the addition of pass and move and specific pattern of play drills. 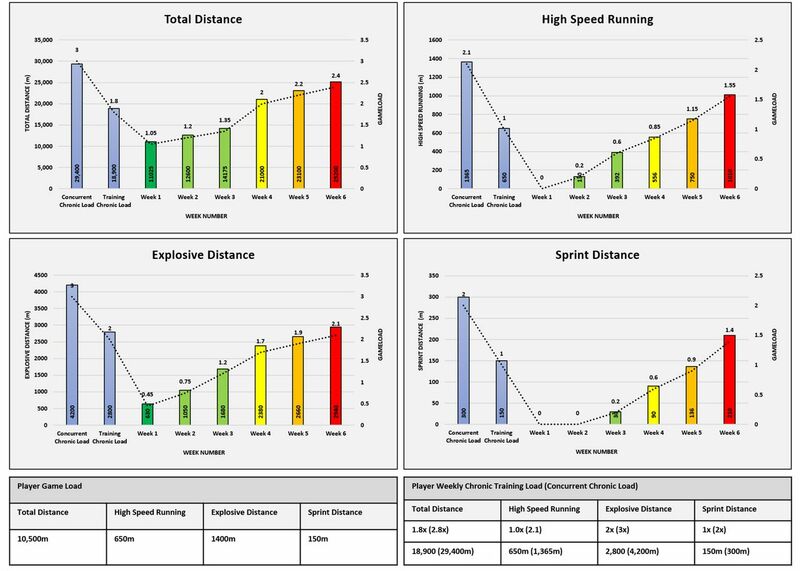 Aims: Return the player to relative weekly training demands (figure 2) and include drills designed to test worst-case scenarios (high speed/high chaos). Technical considerations: passing/crossing and shooting; graded in intensity from short/mid/long range while jumping/heading and tackling; graded in intensity as static/movement/in-context. The volume of technical actions should be progressively increased and be player and injury specific. In the final phase, we emphasise position-specific conditioning and reflect game intensity with volumes relative to weekly preinjury training outputs. Positional specific speed/speed-endurance drills (online supplementary videos 9 and 10) prepare players for game activity—where the speed/direction of the pass dictates how fast the player moves. Technical considerations specific to the injury in question (eg, ball striking activity for a groin injury) form part of our final criteria for return to training, alongside strength and power diagnostics (table 1). In an elite environment, RTS is a dynamic process balancing the benefits and risks of RTS to the player and the team.2 The CCC moves from high control to high chaos, prescribing running loads under progressively riskier conditions. The continuum is the product of scientific evidence blended with years of experience. This framework provides the practitioner with an individualised approach to RTS that integrates quantitative and qualitative progression criteria. Contributors MT and TA wrote the paper and produced appropriate figures. Online supplementary video taken from outdoor physical preparation with MT. DDC provided support and feedback. Competing interests DDC consults to a company who sell strength and power diagnostic devices.